Activist: "People are waiting to be anointed"
(CNN) -- Change was being effected in the nation's black communities long before the word took center stage in the last presidential election. 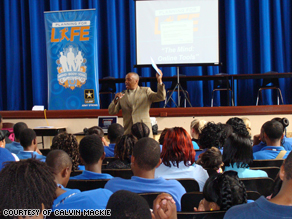 Calvin Mackie, shown here speaking to students, says leadership comes from within. Across the country, countless people have worked tirelessly in their neighborhoods, churches, schools and communities to improve the lives of those around them. The election of President Obama not only galvanized many to get involved, but it also further invigorated those already in the trenches. By transforming his activism as a community organizer into a career as a superstar politician and ultimately commander-in-chief, Obama energized grassroots workers and imbued them with a sense of validation. "After the election, I was completely jazzed and charged," said LaDonna Redmond, who is working to open Graffiti and Grub, a community-owned grocery store with affordable sustainable food on the west side of Chicago. "Even in this economic downturn I was like 'We are opening our grocery store, I don't need a bank [to provide funding].' "
Leadership is a vital concept in the African-American community and has shaped its history. Redmond, like many leaders, was influenced by her passion to right what she viewed as a wrong. The seed for her nonprofit Institute for Community Resource Development sprouted more than a decade ago after she came up empty in her quest to find healthy, unprocessed foods in her community to feed her allergic son. Since then, her nonprofit organization has converted vacant lots into urban farmland, distributed food at farmer's markets and co-founded the Chicago Food Systems Collaboration, which examines food access in the city. Redmond said Michelle Obama's planting of an urban garden at the White House helped solidify for her that she was on the right track. "I was thinking my little lots were not that big of a deal and not only is it a big deal, but Mrs. Obama dug a backyard garden for the whole world to see," Redmond said. "It's not that I thought that my issue was little, but I didn't think that what I was talking about would resonate so many years later with so many people." Taking a leadership role is a personal responsibility, said Richard Lewis, one of the architects of the Colorado Black Chamber of Commerce Foundation's Chamber Connect program, which began two years ago "to identify, harvest and grow future leadership." Lewis said he believes leadership comes about when desire meets hard work and a determination to succeed. "People are waiting to be anointed," Lewis said. "They are waiting for somebody to empower them when really, if you see a problem and feel impassioned and believe you can contribute an answer, then you need to step up." Colorado boasts a small African-American community and Lewis wanted to see black businesspeople in Denver plugged in so they could not only help each other, but also give back. Lewis said he is aware of the pressure in the black community, often directed at political leaders and elected officials, to become an almost messianic leader who will "deliver" and solve all of the community's problems. It is too large a mantle to try and thrust upon the shoulders of any one person, he said. "I agree that our political leaders have a responsibility," Lewis said. "They are elected officials sent to work the process on our behalf, but not in our absence. We need to support them and be involved." Princella Smith is one who is answering the charge for political advocacy. An emerging young voice in the Republican Party, the 25-year-old Arkansas native is director of communications for Louisiana Rep. Anh "Joseph" Cao and previously served as a national spokesperson for Newt Gingrich's American Solutions For Winning the Future organization. iReport.com: How are you making change happen? Smith said she feels no pressure to stand as a spokesperson for women or African-Americans in her party, especially given that she believes black Republicans are painted with a broad brush. "We are not all the same," said Smith, who added that she is nevertheless thankful that so many have looked to her as a result of her work. "Just like there are different types of Democrats, there are different types of Republicans." Leaders are made, not born, Smith said, and she views her role as one who was asked to participate and took the opportunity to become involved in something in which she believes. While she may sit across the political table from him, Smith said President Obama showed strong leadership in getting elected. "He did a very good job of reaching nontraditional political audiences, people who had never ever voted before," Smith said. "I think that is something that anybody can be proud of in this country." Walter Earl Fluker, Ph.D, executive director of The Leadership Center at Morehouse College in Atlanta, Georgia, has borne witness to that pride. Fluker recently traveled to South Africa with a group of Morehouse students who have been studying ethical leadership within the context of developing democracies with a special emphasis on HIV/AIDS and poverty. The author of "Ethical Leadership: The Quest for Character, Civility and Community," Fluker said he believes the president has set a "sterling example of what's possible" for the youth. "I think that his election and his popularity right now has really given community based leadership a very positive lift," he said. "Many of the young people with whom I work are very interested in how they can go back and work as agents of change and transformation at grassroots levels." Morehouse alumnus Calvin Mackie, Ph.D. can relate. After entering the historically black college as a remedial reading student with a thick Louisiana accent, Mackie is today a successful businessman, author and lecturer. He also chairs the Louisiana Council on the Social Status of Black Men and Boys, a statewide commission formed to aid the development of policy to better the lives of black males and families. Leadership, Mackie said, is a way of being and he points to a quote by former President John Quincy Adams, "If your actions inspire others to dream more, learn more, do more and become more, you are a leader" as a guiding principal. It is a mind-set that is not always easy to achieve, Mackie said. "First and foremost, you have to believe that about yourself," Mackie said. "You have to dream, you have to be a scholar, you have to be a doer, and you have to want to become more." Mackie spreads that message of becoming a light and said he, too, has had to learn. After becoming frustrated with the pace of recovery in his beloved New Orleans after Hurricane Katrina, Mackie said he had decided to relocate. A chance meeting with an airport worker whose son was a fan had a profound effect on him, he said. The woman asked him why, with all he had achieved, was he still living in New Orleans and Mackie left mulling her question. "I went back and I found her at the airport," Mackie recalled. "I told her 'You asked me a question and I didn't answer.' I said 'I'm here because of your son, because he needs to know that people like me exist, he can touch me and know that I am not something special and he can do whatever he wants to do in life.' "
He then returned home and took down the for sale sign.